2-Day Designs presents the rolling Boot Caddy which can be totally personalized using single words or initials for a one-of-kind instant classic piece. 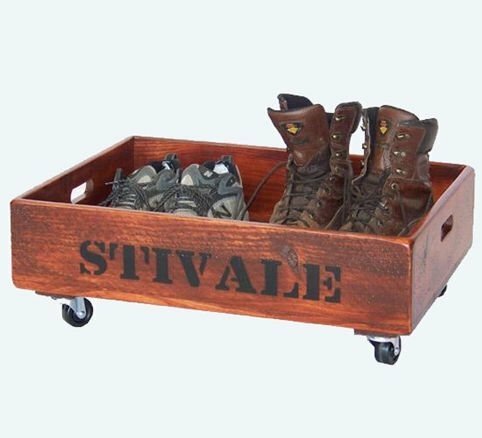 Seasons are changing and we recommend placing your dusty, muddy or snowy shoes and boots in this handy rolling holder to avoid tracking in the home or elsewhere. The Boot Caddy dimensions are 9"H x 25"W x 18"D and is finished in Pine. At 2-Day Designs we are proud manufacturers of unique home furnishing. For those looking for a little something different, browse our collections and you'll certainly find it! From dining tables and chairs, occasional tables, hutches and cupboards, keepsake boxes and trunks, you're sure to fall in love with something from one our many fine collections. If you have any questions about this product by 2-Day Designs, contact us by completing and submitting the form below. If you are looking for a specif part number, please include it with your message.